Ko-Rel cards (#60) from the 2014 Marvel Universe set from Rittenhouse Archives. The Base (common) card, the Sapphire card (1:3 packs), the Emerald card (100 produced) and the Ruby card. Ko-Rel card (#48) from the 2008 Women of Marvel set from Rittenhouse Archives. Shatterforce card (#148) from the 1995 Marvel Annual set from Flair. 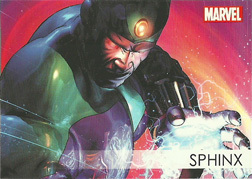 Quasar (Rich Rider) card (#59) from the 2012 Marvel Greatest Heroes set from Rittenhouse Archives. Lady Sphinx card (#104) from the 1992 Marvel Universe Series 3 set. Sphinx & Lady Sphinx card from the Fleer Marvel Universe 1994 set. Sphinx from the Flair Marvel Annual 1995 set from Flair. Sphinx Wanted Poster foil insert card (#M6) from the 2010 Marvel Heroes & Villains set. 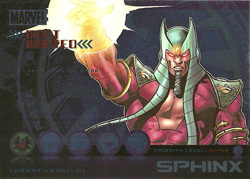 Sphinx card (V15) from the 2012 Marvel Greatest Heroes - Villains set from Rittenhouse Archives.